This unique award – created especially for 2018 – is a chance to celebrate the individual stories of pharmacists and pharmacy staff going ‘above and beyond’ for their patients, their team, and for the sector. C+D readers have until Friday, June 22 to view the 10 entries and vote for their favourite. he winner will be announced at the C+D Awards in London on July 4. Please note: only users registered on the C+D website can vote, and each user can only vote for one entry. 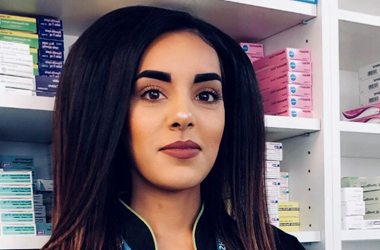 Symia Gulfaraz went above and beyond by braving the snow and freezing conditions when the “beast from the east” hit the UK, and making sure that patients at Evergreen Pharmacy in Halesowen, West Midlands still got their medications. Symia’s car wouldn’t start that morning, so she walked – downhill on an icy road that taxis couldn’t navigate – to the pharmacy. Symia fell over several times – “three times walking to work and four times walking back home” – but she was undeterred, because she knew her patients needed their medication. So despite the freezing temperatures, Symia delivered medicines to these individuals – on foot – trying to avoid “flying down the hill”. Symia says the result of her deliveries is that patients at Evergreen Pharmacy know she is there to help them, and they have someone they can trust and rely on with their medication. There is now a strong relationship between Symia and the patients – who bring gifts to show their appreciation and gratitude. She says the pharmacy has also gained more customers, as the patients who are pleased with the service Symia and her team provided during the arctic conditions have recommended Evergreen pharmacy to their friends.